Ultralight elemental analysis by EDXRF. By Ray R. Fleming and Robert C. Tisdale, Ph.D. Conventional wisdom amongst X-ray spectroscopists has long held that energy dispersive X-ray fluorescence (EDXRF) spectrometers are not capable of quantifying atomic elements less than 11Na (or down to 9F for some special instrument configurations), delivering especially poor results for the ultralight elements of 6C, 7N and 8O1. While mainframe WDXRF spectrometers can routinely perform quantitative analysis down to 4Be for some sample types, this ability has to do with its completely different technologies. 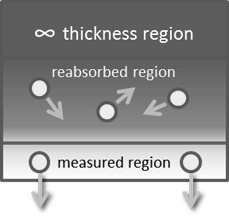 The properties responsible for the physical limitations of EDXRF for ultralight element analysis are examined, including: 1) X-ray tube constraints, 2) sample physics, 3) detector limitations, 4) spectral interferences, and 5) counting statistics. X-ray tubes have numerous intrinsic limitations that are analysed here in some detail. Because of space charge limitations in vacuum tubes3, the minimum operating voltage is typically 4 kV. The maximum available current, when operating at low voltages, is generally limited by the X-ray tube design to less than full power. This problem is typically more severe for side-window X-ray tubes than for modern annular cathode end-window designs. Another X-ray tube issue that impacts the measurement of ultralight elements is the beryllium exit window. If we assume a 25 micron (µm) Be exit window (the thinnest available in the market), the transmission by energy is calculated as shown in the graph.4 Note the illustration is in units of electron volts (eV), so 1000 eV is equal to 1 keV. Little energy is transmitted through the window near the 0.283 keV absorption edge of carbon (6C ). EDXRF analysers are usually equipped with a mandatory thin polymer safety window to protect the X-ray tube and detector from accidental damage and signal attenuation from dust. The film of choice is typically a 4 µm thick type of polypropylene that is 51% transmissive at 1 keV and only about 15% transmissive at 0.7 keV (roughly the Kab of 9F). 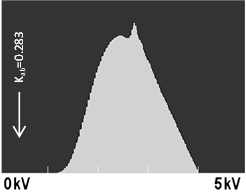 The plot shows the calculated transmission of Prolene in the ultralight region.15 Note that the transmission increases to 50% just below the absorption edge of carbon (0.283 keV), but the fluorescence from the film may be confused for carbon X-rays from a sample. 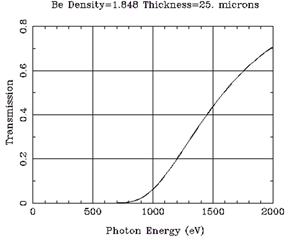 The data indicate that the use of safety window film severely attenuates fluorescent photons from ultralight elements. It is also obvious that the use of a sample cup, with polymer support film, would likewise limit useful quantitative analysis of ultralight elements. X-ray detector technology for EDXRF has made great strides over the past two decades. The late 1980s saw the advent of supported polymer windows for Si(Li) detectors. This increased sensitivity for light elements (down to 11Na). The 1990s saw the development of silicon drift detectors (SDD), which delivered better resolution and much higher count rates. Compared to conventional 4Be windows, supported polymer windows suffer from a reduced solid angle, shadow effects, and fluorescence peaks, when using etched silicon grid support. Aluminium coated silicon nitride windows also show fluorescent peaks and are less transmissive for heavier elements. Some detectors based on these technologies are not light tight. Other detectors based on these technologies are not suitable for He-purge. The Kα lines of 6C through 9F have overlaps with L-series lines of elements 19K through 26Fe. Unlike WDXRF, which can clearly resolve the various lines, the limited resolution of EDXRF precludes this. 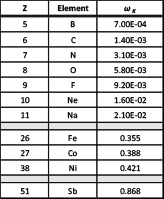 If samples contain significant concentrations of these elements (K, Ca, Sc, Ti, V, Cr, Mn or Fe), ultralight elemental analysis is impossible. As the first equation shows, the relationship between the area of an elemental peak and the error is quite clear. The more counts in a peak, the better the precision of the measurement. Illustrated in the table are some basic examples of the significance of the two equations. With only 100 counts in a 6C peak, 1-sigma error is 10% relative and at the 3-sigma confidence level, it deteriorates to 30% relative error, which is approximately the limit of quantitation. With 1,000 counts, 3-sigma relative error is still almost 10%. It is important to note that these error levels do not include errors from subtraction of the background, the X-ray tube, detector or other instrument electronics. 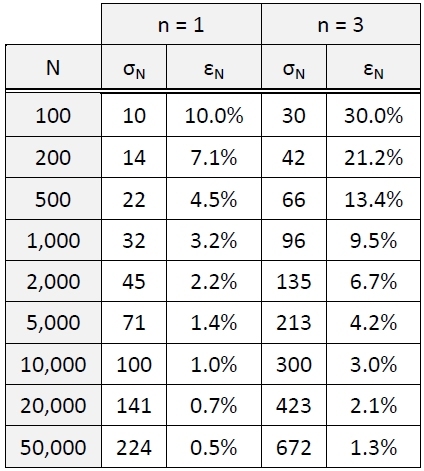 Thus, in practice, these results shown in the table would never be achieved in an actual analytical measurement (i.e., they would be substantially worse). While Rousseau18 has carefully pointed out that this equation is not correct (it delivers a minimum theoretical estimate), it is useful in that it shows that LLD increases as the square root of the background (IB). Consider two examples, where T=60 and C = 3000 ppm. Case 1 has a IB = 30 cps and IP = 330 cps and LLD of 19 ppm. Case 2 is reversed with a IB = 330 cps and IP = 30 cps and calculates a LLD of 704 ppm. So a small peak on a large amount of background will not deliver low detection limits. Ultralight elements, when they can be seen by EDXRF, are usually superimposed on a high background. This review has covered the performance characteristics of current technologies as they apply to the measurement of ultralight elements by EDXRF spectrometry. It was found that low power X-ray tubes, as used in typical commercial EDXRF instruments, have severe limitations relative to their ability to efficiently excite ultralight elements. The samples themselves present a host of generally insurmountable challenges to quantifying ultralight elements. From micron-scale analysed depth to matrix absorption and self-absorption of photons, most sample types are not be amenable to quantitative analytical study for ultralight elements. While detector technology continues to advance, the new window technologies are still best suited to improving “light element” (down to 11Na and sometimes 9F) by reducing count times and delivering somewhat better counting statistics. However, said performance can come at the price of parasitic fluorescent peaks and/or some intensity attenuation for heavier elements. Other elements are frequently present in samples and sample support films producing spectral interferences that cannot be overcome. Ultimately the counting statistics are so poor for ultralight elements analysed by EDXRF that it their concentrations are not quantifiable. Robert C. Tisdale received his Ph.D. in inorganic chemistry from the University of Nebraska – Lincoln in 1986 and M.B.A. in technology management from The University of Texas at Austin in 1988. Tisdale lives in Austin, Texas and has worked in the analytical chemistry field for over 40 years. He specialises in the strategic management and analytical marketing of scientific equipment and related technologies. Ray R. Fleming received his Bachelors of Science degree from the University of Houston in 1986. Fleming lives in Austin, Texas and has worked in the field of health physics for 27 years. He is currently the Manager of the Radioactive Material Licensing Group of the Texas Department of State Health Services. 1. Bertin, Eugene P. Principles and practice of X-ray spectrometric analysis. Plenum Press, 1975, p709. 2.Henry H. Bauer, Gary D. Christian, James E. O'Reilly. Allyn and Bacon. Instrumental Analysis. 1978, p387. 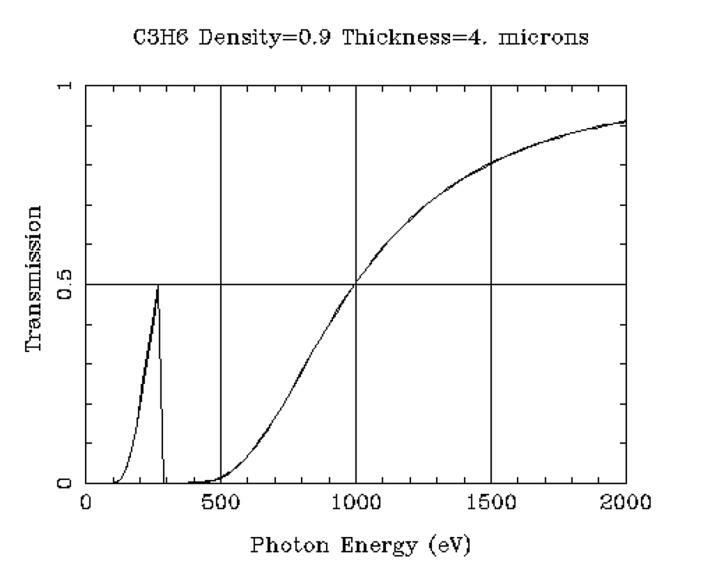 3.Schwartz, J. W. Space charge limitation on the focus of electron beams. Electron Devices, IRE (1957): p196. 6. Bertin, Eugene P. Principles and practice of X-ray spectrometric analysis. Plenum Press, 1975, p709-710. 7. James W. Robinson, et.al. Undergraduate Instrumental Analysis. CRC Press (2104), p650. 8. James W. Robinson, et.al. Undergraduate Instrumental Analysis. CRC Press (2014), p651. 9. Bertin, Eugene P. Principles and practice of X-ray spectrometric analysis. Plenum Press, 1975, p709-710. 10. Bertin, Eugene P. Principles and practice of X-ray spectrometric analysis. Plenum Press, 1975, p83. 11. M.O. Krause. Atomic Radiative and Radiationless Yields for K and L Shells. Nat. Std. Ref. Data System. 1979, p314. 12. Eric Lifshin (Editor). 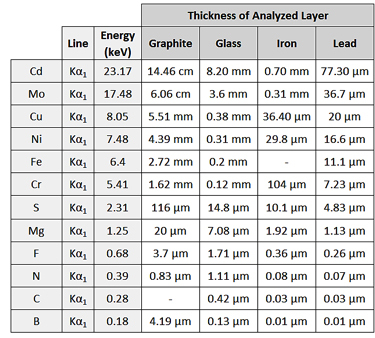 X-ray Characterization of Materials. John Wiley & Sons. 1999, p11. 13. Bertin, Eugene P. Principles and practice of X-ray spectrometric analysis. Plenum Press, 1975, p709. 14. Liebhafsky, Herman A. X-rays, electrons, and analytical chemistry: spectrochemical analysis with X-rays. John Wiley & Sons, 1972, p449. 16. Bertin, Eugene P. Principles and practice of X-ray spectrometric analysis. Plenum Press, 1975, p709; Chaney R. Durham, et.al. Chemical Environment Effects on Kβ/Kr Intensity Ratio: An X-ray Fluorescence Experiment on Periodic Trends, J. Chem. Ed. 2011, 88, p819–821. 17. Bertin, Eugene P. Principles and practice of X-ray spectrometric analysis. Plenum Press, 1975, p476. 18. Rousseau, Richard M. Detection limit and estimate of uncertainty of analytical XRF results. Rigaku Journal 18.2 (2001) p33-47.